Delaney was a fun loving little girl who was a student at Wyomissing Hills Elementary in the second grade. She enjoyed participating in Girl Scouts and was a beautiful ballerina. Laney loved all things girly especially pink and animal prints but did have a special place in her heart for alligators. She was an avid shopper and loved fashion. On May 27, 2013 she was diagnosed with high risk AML with monosomy 7. Due to her high risk and resistance to the chemotherapy she had an extensive stay at Hershey Medical Center while doctors determined how to manage her very rare case. She was one of ten in the nation to have the genetic marker of monosomy 7. We had gone for a second opinion at CHOP and they had told us that because it is so rare that there are no new medications for it or trials in the works. That was one of the most devastating days of our lives. Laney spent almost 150 consecutive days admitted to Hershey hospital. We tried to make this period of time fun for Laney by playing jokes on the doctors and nurses, baking with her easy bake oven, painting her room’s window with murals, and doing arts and crafts. The process of getting her leukemia cells down had gone much slower than most and had required very high doses of chemotherapy. Laney had undergone multiple bone marrow biopsies, spinal taps, and tube insertions. Throughout the process she remained upbeat and optimistic. She had faith that her cure was on the horizon and she would be healed. When they finally got the cancer cells as low as they could get them they started to prepare her for a bone marrow transplant. She required full body radiation (total body eradication), high dose chemo therapy, and immunosuppressants prior to her transplant which happened on September 19th. She received umbilical cord stem cells because her cancer was so aggressive and came back so fast that they couldn’t risk the time needed to prep a bone marrow donor. We needed these new cells to kill off the last small amount of cancer that the chemo and radiation were ineffective in killing. After waiting anxiously for her counts to come up, we finally received the news that she was 100% donor cells and there were no cancer cells in her blood. She was officially in remission! She was finally discharged from the hospital on October 23rd to a local apartment for frequent clinic visits. She had spent over a month out of the hospital without any complications. Towards the end of November she acquired a virus. The doctors were giving her medication outpatient to hold the virus at bay till her new immune system kicked in and began to produce virus fighting cells. They were able to treat her outpatient for a couple weeks but even with the medication her viral count continued to climb. On December 8th she developed a fever and they decided to admit her to the hospital. She wasn’t feeling well during this time and began to lose weight. Her viral count was still rising as well. 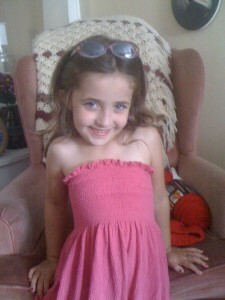 Then on December 17th we received the most devastating news, that they had found cancer cells in Laney’s blood again. We were told that if they treated the cancer with chemotherapy it would kill off any cells that were keeping the virus from taking over her body and she would die. And if they treated the virus the cancer would overtake her body and she would die. They estimated that she had a couple days to a week to live. No parent ever wants to hear that there is nothing that they can do for your child. I will never forget that moment when my world was shattered and my heart broke. We made the decision to take her home. She hadn’t been home since July so it was important that she got to come home for her last moments of life surrounded by family and friends. 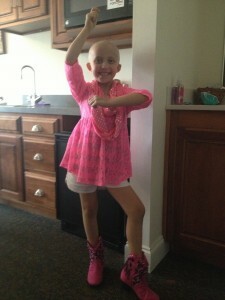 She was discharged from the hospital on December 19th the day before her 8th birthday. We celebrated her birthday on the 20th and Santa came early for her on the 21st. We tried to keep her as comfortable as possible. On Christmas morning at 3:10am Laney took her last breath in the arms of me and her father. We experienced a brutal emotional pain that day and every day since, a pain that no parent should ever have to bare. Our children lost their sibling and Kylee, her sister, lost her best friend. Our world has forever been changed. We miss her dearly everyday and are anxious for the day we get to meet her in heaven with her pink glittery angel wings.